Stone Creek Builders is proud to announce they are doing their fifth house lift for this year. 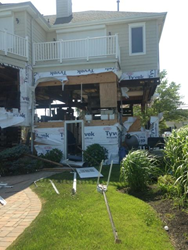 Two years after Hurricane Sandy slammed into the Jersey Shore, Stone Creek Builders is still getting phone calls for help. Every month the sales team is still going to the Jersey Shore for estimates on house lifts, a representative from SCB says. We get five to ten calls a month for people wanting us to help them. Waiting lists for grant programs and funding set aside by the Federal Government are long, and Governor Chris Christie has promised that New Jersey residents will receive the money they need to get back into their homes and move ahead with their lives. Right now SCB are on their 5th house lift for this year. We have three in Sea Bright, one in Manoloking, and the newest one is in Union Beach. Stone Creek Builder continue to be busy helping property owners successfully navigate the requirements of the mitigation program. As soon as homeowners receive the money they deserve from the grant programs, Stone Creek Builders go to work performing a thorough reconstruction and rehabilitation of the property, using careful and cost-effective methods to restore and maintain the health and well-being of all structures on the property.